as the two new teams would stock their rosters with 39 players each. The Jets lost two player to Seattle: DL Larry Woods and DB Jerry Davis, and one to the Bucs, RB Anthony Davis. Ending a strange, strained couple of years for Davis and the Jets. Anthony Davis was a stud in college, a 2nd round pick out of USC for the Jets in 1975. 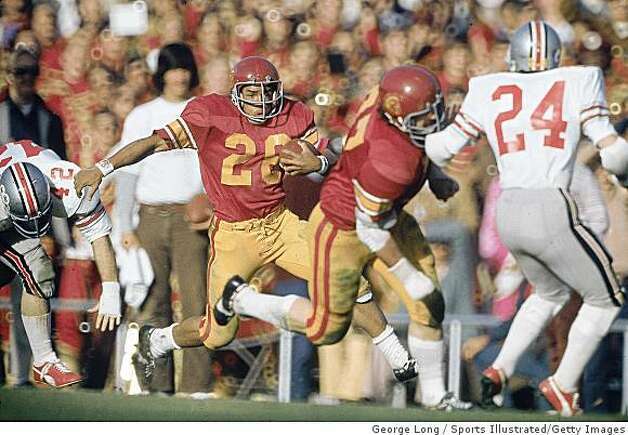 He was one of a long line of great USC tailbacks from the 60s through the 80s, including Mike Garrett, OJ Simpson, Ricky Bell, Charles White & Marcus Allen. Davis had finished 2nd to Archie Griffin in the Heisman Trophy voting in 74 and seemed like a steal for the Jets in the 2nd round. It didn't quite work out that way. Davis was happy to be a Jet and to play with Joe Namath. He was happy at least until he met Jets HC Charley Winner. He and Winner immediately clashed. According to Davis, “I’d had a long friendly talk with Joe Namath at the Washington Touchdown Club about playing with the Jets and he was very positive about what he thought I could do for the team… Joe said I’d fit right in, but Winner expressed doubts about whether I could make it in pro football." Unable and unwilling to agree to terms with the Jets, who offered him a 3-year deal worth about $100K, Davis instead opted to play for the Southern California Sun of the World Football League. He signed a 5-year $1.7 million contract with a $200K signing bonus. He led the WFL in rushing in 1975. The league folded after the 75 season, but Davis chose the CFL rather than the Jets. Davis was a disappointment when he joined Tampa for the 77 season, as he gained only 304 yards in a 2-year NFL career that included stops with the Oilers and Rams in addition to one season in Tampa. charley winner was a huge mistake. You sir, are absolutely correct. Only reason he got the job was due to him being Weeb's son-in-law.